A feature on WRCB Television’s Eye on Health Segment brings attention to Erlanger East Hospital’s new center offering radiation treatment for cancer and other services of great benefit to the Chattanooga community. I was interviewed for the segment by Reporter LaTrice Currie, who describes the latest addition as “a one-stop-shop” for cancer patients. The Erlanger East Hospital Building C was celebrated during an Open House event on January 17th. The Center on Gunbarrel Road joins Erlanger’s Centers of Excellence. In the TV segment, I discuss the center’s linear accelerator and explain how it works, customizing high energy X-rays to conform to a tumor’s shape and destroy cancer cells while sparing the surrounding normal tissue, which can shorten the length of time needed for radiation treatments. I also talk about ways new technology makes getting a mammogram easier and less painful in the Breast Center. This technology provides results and much faster diagnosis. 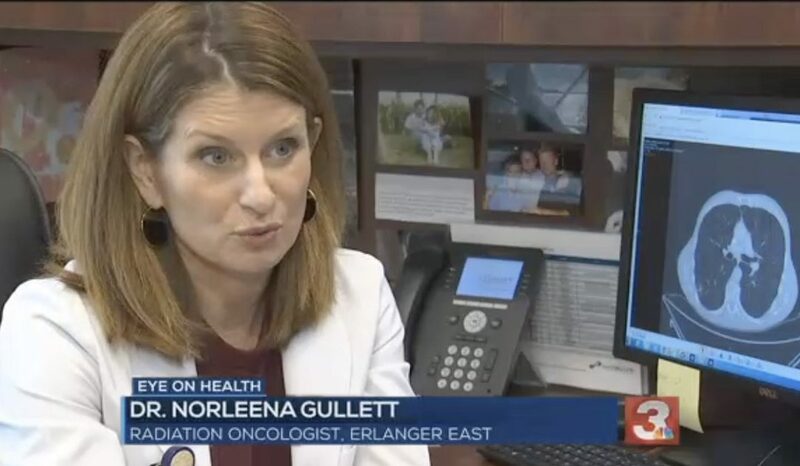 Additionally, the WRCB segment mentions how patients at Erlanger East can get infusion services, pulmonary and critical care, along with dermatology treatment. For the segment, LaTrice Currie interviewed patient Philip Cagle, who was treated at the center.